Shale gas exploration and development, nuclear power generation, conventional and combined cycle combustion plants, wind power or tidal power generation - what are the environmental consequences and how do we decide what's best? A new multidisciplinary course, "Energy and the Environment: Designing the Future," will examine the factors underlying the choices we make and the impact of each. Time: Thursdays, 2:00 p.m. - 5:00 p.m.
"Energy and the Environment: Designing the Future" explores the current state-of-the-art of power production technologies while keeping in mind the needs and values of the impacted communities and the environment. 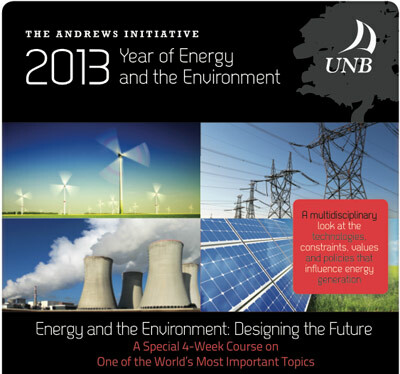 Led by engineering professor William Cook, who will be joined by UNB faculty from sociology, environmental management and economics, the course intermixes lectures with group breakout sessions and discussion. Tuition for the course is $130. Register online or call 506-453-4646. For more information, please contact Susan Montague.